Before the introduction of home video, the only way to provide play-on-demand versions of entertainment was via record albums. With hi-fi stereos and small children’s record players becoming part of standard home furnishing, the market for albums of all types boomed, and the offerings for children in the 1960s and ‘70s were particularly rich. 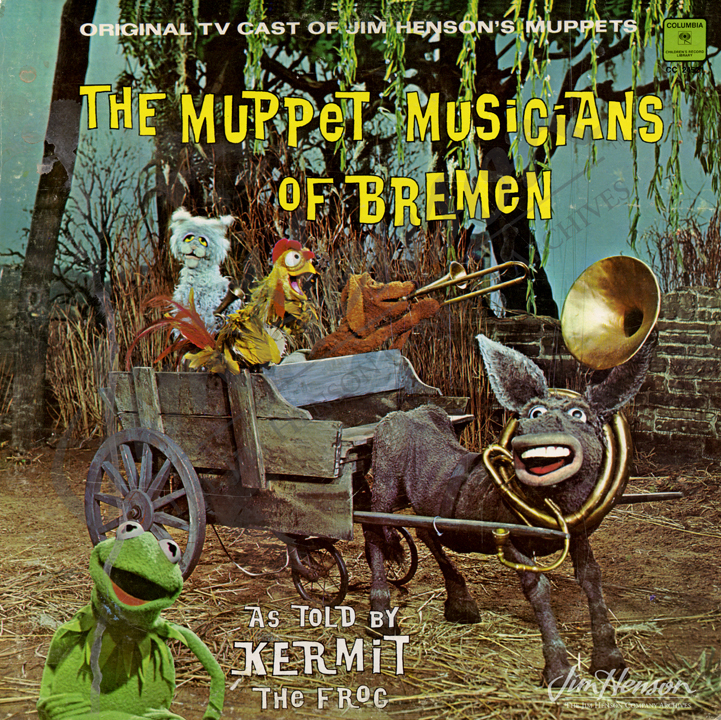 Having already participated in a couple of Sesame Street record projects, Jim’s first venture into the storytelling album area was with his television specials The Frog Prince and The Muppet Musicians of Bremen. 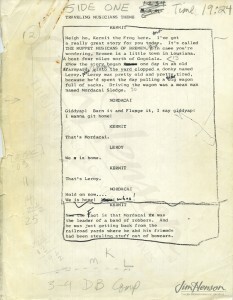 For both shows, a script was adapted by Jim and Jerry Juhl for the record album format, and the audio was specially recorded. Both were released on Columbia Records. To make the experience of listening to the album immersive, scene by scene images were reproduced inside the fold-out album cover. That way, children listening to the story could follow along with the images as the action unfolded, much like they might on an iPad today. Clearly, the two records were a success as both were rereleased within a few years. 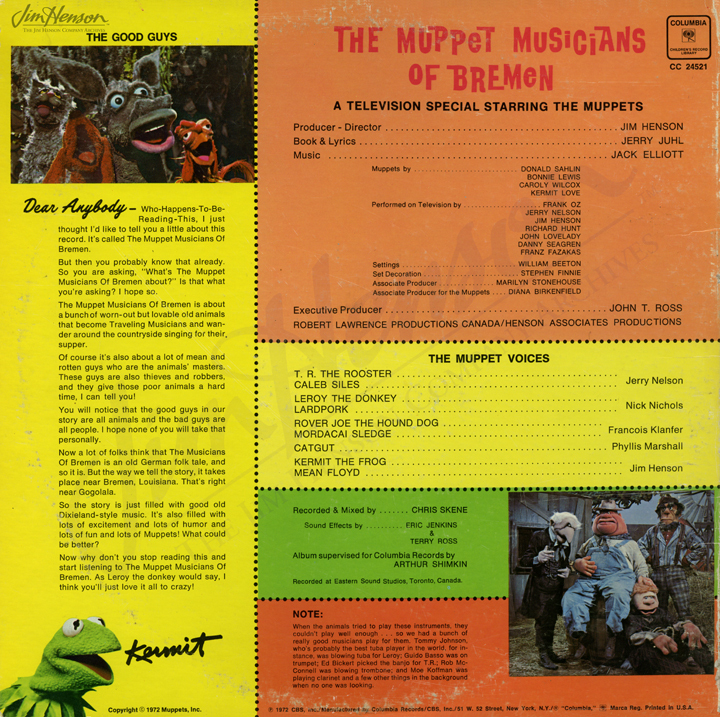 Learn more about The Muppet Musicians of Bremen television special. 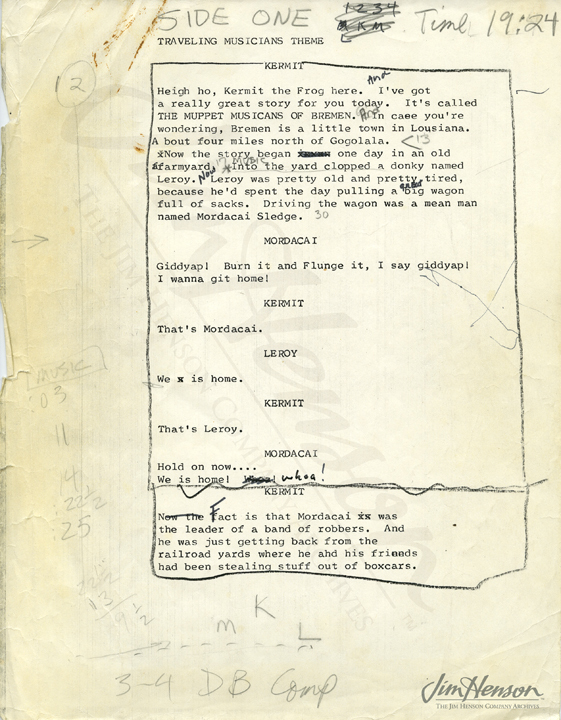 Jim’s annotated script for The Muppet Musicians of Bremen record album. Front cover of The Muppet Musicians of Bremen record album. 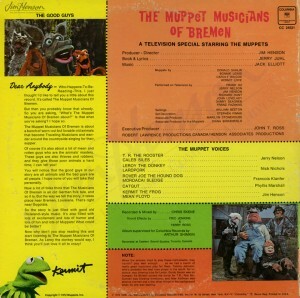 Back cover of The Muppet Musicians of Bremen record album. This entry was posted in 05-May '72, 1972, Muppet Musicians of Bremen and tagged Columbia Records, Jerry Juhl, Sesame Street, The Frog Prince, The Muppet Musicians of Bremen. Bookmark the permalink.